A Summer of Cycling Brings the Art of the Race to Richmond | News and Features | Style Weekly - Richmond, VA local news, arts, and events. Science Museum of Virginia Among the art projects and cultural exhibits that coincide with the races is “Bikes: Science on Two Wheels,” at the Science Museum of Virginia. The Richmond area will be awash in art and exhibitions as the races approach, including larger-than-life wall murals, the science of the two-wheelers, custom-painted bicycles and art pieces at strategically selected rural bike routes. To cheer up the race route, four well-known Richmond artists — Ed Trask, Matt Lively, Greg Leach and Hamilton Glass — plan to paint murals on a 7-foot-tall wall stretching for four blocks from Belvidere to Oregon Hill, Trask says. Artists also will enliven parts of the rural Virginia Capital Trail bike route east of Richmond near Route 5. Scattered about will be pieces of art, such as murals painted on barns, with a theme of preventing unwieldy suburban sprawl. “The idea is to bring up a conversation about preservation,” Trask says. About half a dozen other artists will decorate other routes. An exhibit at the Science Museum of Virginia explains how energy, force, aerodynamics and engineering come together to make bicycles work. Featured are early bicycles such as the Bonecrusher, an 1869 iron and wood contraption that had an extremely uncomfortable ride. 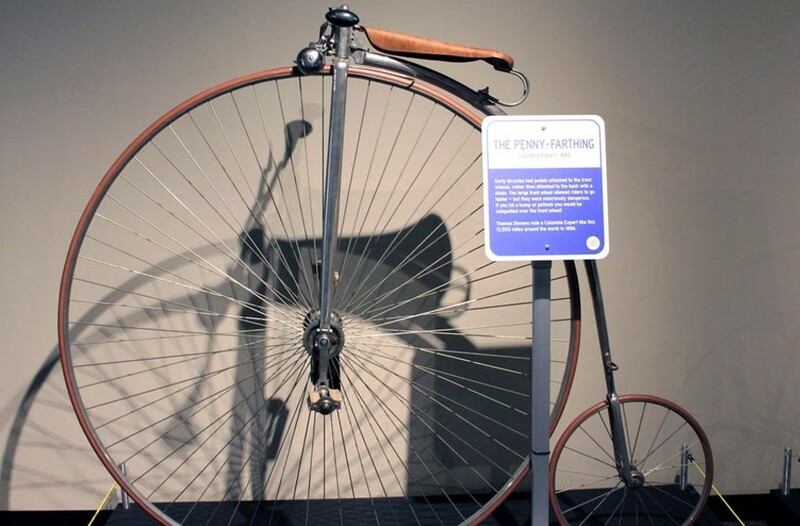 Another early model was the Penny Farthing, which has a gigantic front wheel and a small rear one. The bike broke many limbs until the safety bicycle came around in the 1880s. High-tech modern versions will be explained as well. On Sept. 19, the Richmond Cycling Corps, which promotes biking for all ages, will recruit 23 local artists, including Trask, to hand-decorate bike frames. Craig Bodson, founder of the corps, says the location will be announced later. The UCI Road World Championships arrive in September, along with an estimated 450,000 spectators in nine days. Leading up to the race, Style is featuring vignettes on some of the plans across the city to prepare, capitalize and cash in on the big event.